Care Centre on New Year’s Eve under the Communal Awareness Project – Flying Angels – which is part of the Humanities Faculty, Education Faculty and Higher School of Nursing. 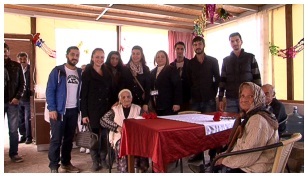 Gűnay Beyzade emphasized that the Flying Angels project intends to reach all parts of the society helping people in need, providing care for the elderly and children and supporting education and by this means GAU teaching staff and students visited the Lapta Elderly Care Centre for medical and psychological support. the community are working people and therefore have limited time to spare for their elderly relatives and pre-school children. Flying Angels, at this point, provide support to the families contributing to the values of the elderly and children through the project. Citizens seeking help and service within the scope of the project can call 0392 650 2000 extension 1280 or make direct contact to the Project Co-ordinator by telephoning 0548 830 0618. Further details can be obtained on www.gauflyingangels.com. The project is intended to be expanded to other cities with the intention of establishing a sound society and happy, healthy children.